Mondelēz Global is promoting Wheat Thins in a new advertising campaign, “Must. Have. Wheat. Thins”. The campaign was inspired by the brand’s most passionate fans and aims to depict the intense relationship they have with their favourite snack. “Night Vision” brings in the Yeti. “Puppet” brings in a puppet in hospital who cannot physically eat Wheat Thins. Fans who tweet #MUSTHAVEWHEATTHINS are given opportunities for special attention. The “Night Vision” launch ad features a man so passionate about this Spicy Buffalo Wheat Thins that he’ll do anything to protect them from even the most unexpected intruders — even a yeti! In “Puppet”, touted as the 2014 Big Game spot leaked in 2013, we meet John, a puppet who is facing the moment every puppet dreads: being told that he can’t eat Wheat Thins. On February 3rd, 2013 Wheat Thins reps personally delivered free Wheat Thins to people in San Francisco who tweeted #MUSTHAVEWHEATTHINS. 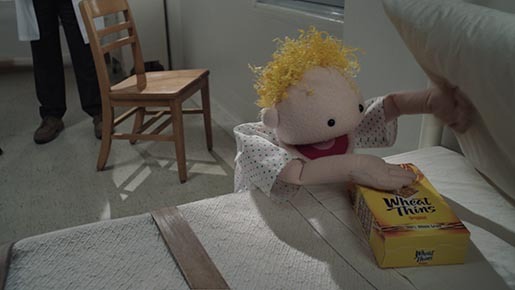 The Must Have Wheat Thins campaign was developed at BEING, New York, part of the TBWA Worldwide network, by chief creative officer Mark Figliulo, creative directors Lisa Topol and Samira Ansari, art director Jonathan Mackler, copywriter Jim LeMaitre, head of production Robert Valdes, project director Christine Austin, executive producer David Fisher, group account director Brett Edgar, account director Kim Tice, and account executive Hunter Serenbetz. Filming was shot by director Ulf Johansson via Smith and Jones Films with executive producer Philippa Smith, line producer Megan Moore and director of photography Andrzej Sekula. Editor was Carlos Arias at Rock Paper Scissors with assistant editor Chris Mitchell, executive producer Eve Kornblum and producer Helena Lee. Visual effects were produced at MPC by VFX supervisor Mikael Petterson, 2D compositor Jonathan McKee and VFX producer Phil Whalley. Puppet characters were produced at Creature Effects by puppet fabricator Bob Newton, puppet builders Carol Binion and Adia Cafer, and supervisor builder Mark Rappaport. Colorist was Tim Masick at Company 3. Sound was mixed at Sound Lounge by Tom Jucarone. Digital online work was done at AKQA.